Join our 2019 ASL Inclusion Crew! More Southeast Conservation Corps positions are posted below! Please see the table below for open positions with Southeast Conservation Corps. Click the 'Apply Here' link for more information and instructions to apply. For more information about position that will open in the future, please see individual program pages. Good luck! See all Leadership Opportunities and positions here. Southeast Conservation Corps (SECC) seeks applicants who are interested in fully committing to the program, who are willing to overcome any challenges and those who will take advantage of the opportunities, skills and trainings that are offered throughout their term of service. SECC seeks those who will benefit from and contribute the most to the program; previous experience is not required for most positions. Southeast Conservation Corps emphasizes the recruitment and engagement of diverse teams and individuals who learn from each other and their projects in a supportive environment. In selecting participants, Southeast Conservation Corps encourages all types of diversity including, but not limited to; race, ethnicity, gender, sexual orientation, gender identity, age, social-economic, and disability. Southeast Conservation Corps also emphasizes the engagement of local individuals who represent the communities in which they serve. 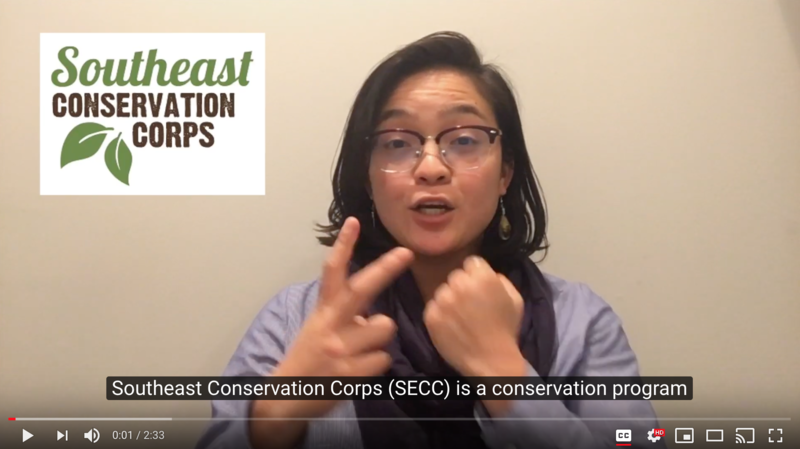 Southeast Conservation Corps intentionally searches for funding sources and program options to support the goal of offering experiences to a wide range of participants.